Tick charts are day trading charts that measure transactions. I have been using tick charts for over 10 years in my trading because they are very simple to use and highly effective to be able to gauge momentum and strength. Being a day trader for so long, I prefer to keep everything as simple as possible with my day trading strategy. I have always use tick charts for my own personal trading. What exactly do tick charts measure? Its the amount of transaction per bar. To give you an example if you have a 610 tick chart, each bar measures 610 transactions per bar. After 610 transaction are over a new bar plots. You can choose a number of different size charts but most traders choose Fibonacci time frame charts (click here to learn more). Being a typical bar chart, there are four different aspects to a tick chart that we can identify. Of those four aspects, we really only pay attention to 3 of them, the open of the bar isn’t important since we are looking to anticipate the future not look at the past. You can use tick charts for the Forex markets and many of the traders that I have trained actually use my variation of indicators to trade the 6E, or the futures contract to trade the euro vs the dollar. If you are interested in trading Forex I would recommend using 220 tick chart as your main chart. I’m currently training a handful of traders and only accept a limited number of people a month. If you are interested, contact me via the contact form on this website. 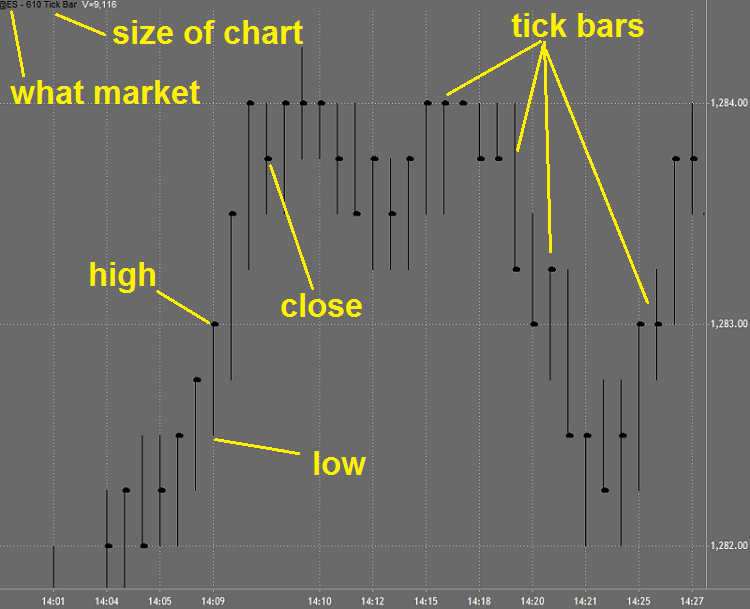 Tradestation Tick Chart feed: Bundled! Interactive Brokers Tick Chart feed: Bundled!